Not only has Juergen been adding style, pride and awareness to laptops worldwide, he's also launched a podcast. I love podcasts. I listen to a few good science shows every week and I've been looking for some decent software related shows, and this one hits the subject matter right on the head. So head to apex.press/talkshow and put this on your audio feed. I listened to it in the car to & from work last week. 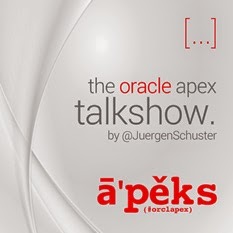 It's an hour of an interesting interview with APEX brainchild Mike Hichwa describing such things as the origins of Oracle Application Express. You may think "oh yeah, heard it all before", but I think there are some great insights to learn from how APEX has arrived in this position and what it means for it's future. I think a telling point was near the end of the interview where Mike points out the big difference between the Oracle Forms and Oracle APEX development teams - the latter use the product day-to-day and have a vested interest in driving it in the right direction. As a former Forms developer, I can appreciate how valuable the packaged applications are to the broader community, whether you use them or not. I often wonder how important the chicken/egg paradox of the APEX builder is to it's long term survival. I think it provides a productive, long future, with a great relationship to the database. Follow your site, great articles, using sys_context for dynamic views and works great..
Can you confirm if the Oracle Plugins Page need some updating because of JQuery bumped up to Version 2. That being said, I've seen a few questions on the OTN forums stating plugins no longer work and it's usually just down to supporting file location.